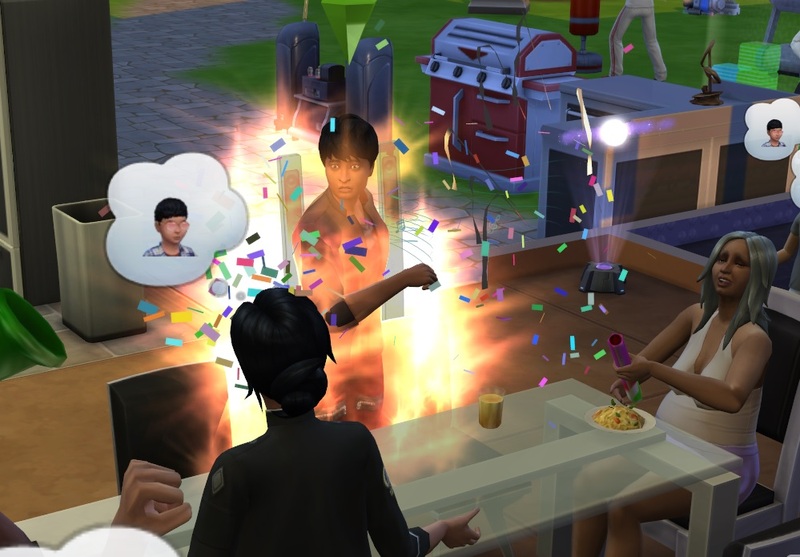 If this Legacy Challenge has taught me anything, it’s that playing multiple Sims isn’t as fearsome as I used to believe it was. Maybe it’s easier in Sims 4 — I’ll have to load up Sims 3 and try that out sometime — or maybe the Legacy Challenge provides enough structure (and randomness) for me to be able to handle it. Whatever the case, after going to seven Sims upon the birth of the trips, I went one step further and brought Ratscrew’s husband Derek into the household, because why not, and incidentally picked up the 8-Sim household achievement. Yay, I guess (I’m not really getting fired up by the cheevs in the Sims…). To be honest, one reason I did it is because Derek had aged to Elder and I figured it wouldn’t be for very long — in which I was absolutely correct. In the space of the last few playsessions, the trips aged to teens, Baccarat apparently still a bit bemused that his siblings haven’t conveniently died off. But he likes them well enough, most of the time, even if they’re clearly lesser beings. I’m not entirely sure about Baccarat – so far he’s the heir I’ve liked least, though admittedly he’s only the second one. Where Holdem quite clearly took after both his parents, Baccarat seems to want to take after his mother (and perhaps Great-Aunt Solitaire, everyone did say she was batshit crazy), as his teen trait ended up being ‘Bro’ — a trait I have absolutely no idea what to do with. I’m pretty sure Elise hasn’t given a bro-hug since she joined the Mirage family, mainly because there aren’t any other bros in her life. (Speaking of which, once the household grew to 5+ people, it got really difficult taking anyone out anywhere… Maybe that’s just me.) And Baccarat just doesn’t strike me as the sports-watching, partying, beer-guzzling type; but perhaps he is, somewhere under insanity that makes up the rest of his personality. I’ll be interested to see what his adult trait will be. His teen (and therefore adult) aspiration was fun to get though, because I’ve not tried it before: he picked up Freelance Botanist. Actually, I guess that means he’s taking after his paternal grandfather a little bit, so maybe it’s not all Mum’s family in there after all. I’ve been making really good money from selling some of the perfect fruit and veg the family’s been growing, and hopefully that will compensate for when my current breadwinners (all 4 of them above level 7 in their career) aren’t there anymore. As for the other trips, I’m trying not to get too attached to them because I will most likely kick them out as soon as they hit college age (I still have to figure out how one does that, but do it I will). 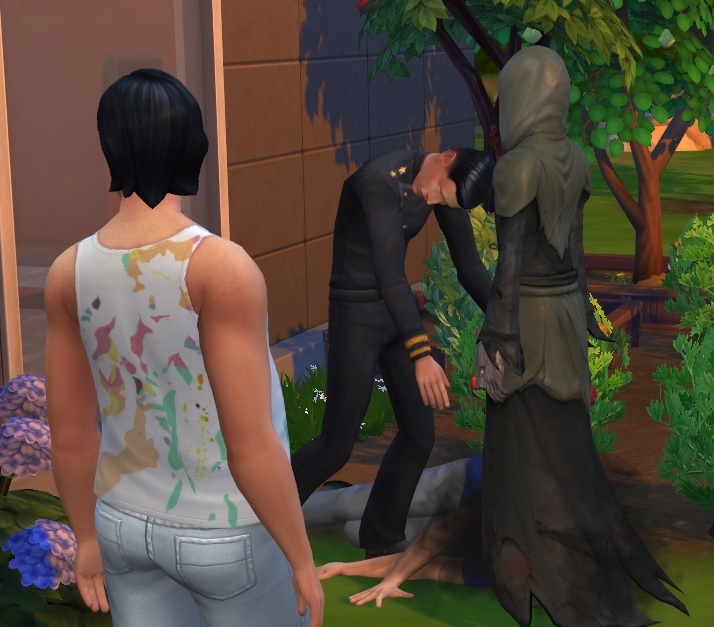 While it was interesting to play eight Sims for a while, I’m pretty keen to go back to a smaller household — too many Sims and the experience starts to feel very fragmented and scattered, even though I’m doing my best to allow them to do what they want at least some of the time. Incidentally, Poker picked up Creative and Bodybuilder as his trait/aspi combo, and Canasta got Perfectionist/Big Happy Family. I’m seeing some interesting family lines developing, and in that respect I’ll be sorry to see the younger trips go, but I really can’t be doing this 8-Sim household thing all the time. Never having played a Sims game I find these accounts fascinating. It’s like some kind of surrealist soap opera. Stargrace at MMOQuests was chronicling her S3 Legacy for a while and of course there was the classic Alice and Kev blog. I wish The Sims MMO had done better, It seems like a natural fit but it was over almost as soon as it started and I never got around to trying it. Alice and Kev was a classic – not just soap opera, but actual drama. And yes, it was Stargrace’s accounts of her legacy efforts that first got me intrigued. This is great. I have only 6 sims in my house right now and I’m ready to start kicking people out. I just don’t have enough time to concentrate on any family member the way he/she needs to be. We’ll see. Looking forward to what’s next!